Thank you all for coming to the lecture on Sunday afternoon to hear Colleen Thibaudeau, James Reaney’s widow, talk about their early days together and read from some of his works. For those of you who were unable to attend, Stratford Beacon Herald reporter Mike Beitz reports on Thibaudeau’s talk here. Our thanks also to the organizers of the lecture at the Stratford Public Library, Charles Mountford, Anne Marie Heckman, and Sam Coghlan. Colleen Thibaudeau especially appreciated all the help she has had from her family and others; she couldn’t have done it without you. One of James Reaney’s poems that Colleen Thibaudeau read was “White Grumphies, white snow” from Souwesto Home, published by Brick Books. Somerset Maugham, Joseph Conrad, Emily Dickinson. Book by book, as I taught them. A very proper and even beautiful pig-driving stick. Was it their mid-term test in pig-herding? Presented them with optical problems. They had trouble seeing me as well. My editor, Stan Dragland, wishes me to explain “White Grumphies, white snow.” They are white pigs herded by agricultural students on a snowy day. 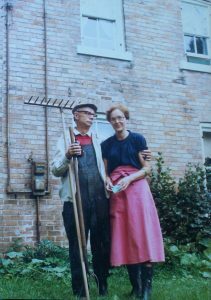 James Reaney and Colleen Thibaudeau near Stratford, Ontario, 1982.